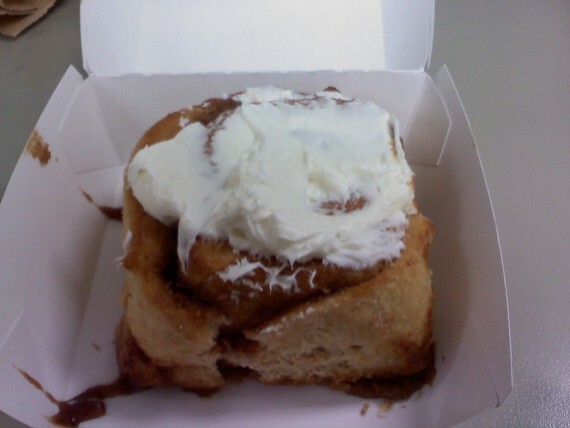 Mutual Weirdness: Sunny Skies, Cool Breezes and Cinnamon Rolls! Today is the weekly farmers market and there are many more vendors there today than the past couple of weeks since the season has officially started now. I was already planning on going over there, but as I was heading to the ATM for some cash a co-worker walks past me and lets me know that there are fresh strawberries there. !! I love strawberries, and its actually quite rare for them to be at our market. So I double time it to the ATM then out the door to walk down the street. Of course the vendor that has them is all the way at the end of the row, but no matter, he had tons of strawberries. $4 for a quart or $10 for 3 quarts. I only bought one, but I was really tempted to go for the 3. After that I knew I wanted to stop the bread vendor and the honey vendor. The bread guy always has fresh scones in the morning and I was planning on getting one of those, but something else caught my eye. Fresh Cinnamon Rolls! This is new so I had to get one! I also picked up a loaf of 10 grain bread. I was torn between that and the honey wheat, but we are planning on making tuna later in the week and I think the 10 grain would work better for it. My hubby got me hooked on tuna with apples in it. Growing up tuna sandwiches always just had tuna and mayo. I wasn't much of a relish person. Now I love it with relish and apple both. So yummy! My last stop was the honey guy. Sometimes I'll go to the market just to go to his booth. I picked up 5 honey sticks in sour strawberry, sour watermelon, cinnamon (x2) and clover. The hubby doesn't eat honey so I don't bother to buy more than that. I didn't see any of his honey paste there today though or I would have bought some of it. Strawberries pureed with honey is soo yummy! He also has honey soaps, lotions, chap stick, and other things. And today he had some fresh gooseberries. I was also looking for some zucchini today too, but didn't see any. Probably too early in the year yet for it. All of a sudden yesterday I decided that I want zucchini cake even though I've never made it. Probably a good thing I didn't find any to buy as I still need to look up a recipe. I was also tempted to stop by the apple stand and buy some apple cider doughnuts. They are so yummy also, but I decided that the cinnamon roll was enough for today. So I'm in a happy mood as I have yummy goodies. The week is half over. Hubby's last day of work is today, then he's on a break for the summer.